Now includes free e-Book! There’s more than meets the eye to building a successful associateship. This practical guide offers strategies for tackling both logistical issues – such as the type of associate arrangement, compensation, contract terms, and buy-ins – and intangible ones, including interpersonal considerations and compatibility, developing a practice philosophy, and conducting a goals assessment. Ideal for either adding or becoming an associate, this valuable book contains worksheets for cash flow, break-even and associate compensation analysis, as well as a sample associateship contract. 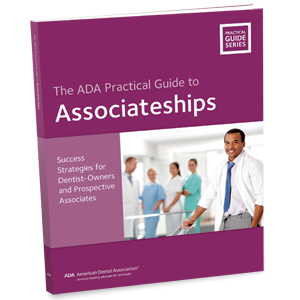 The ADA Practical Guide to Associateships also covers the phased buy-in process, as well as considerations for the dentist who is thinking about joining a large group practice. 97 pages. This e-Book can be viewed from any device with web-browsing capabilities. A link will be provided in your Order Confirmation email. Your can also access your e-Bookshelf from your My ADA page (go to My Account/ My Downloads). For e-Book details, visit the e-Books FAQ page.